What does religion mean to the individual? How are people religious and what do their beliefs, practices and identities mean to them? The individual's place within studies of religion has tended to be overlooked recently in favour of macro analyses. 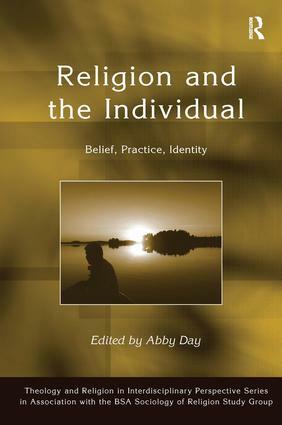 Religion and the Individual draws together authors from around the world to explore belief, practice and identity. Using original case studies and other work firmly placed in the empirical, contributors discuss what religious belief means to the individual. They examine how people embody what religion means to them through practice, considering the different meanings that people attach to religion and the social expressions of their personal understandings and the ways in which religion shapes how people see themselves in relation to others. This work is cross-cultural, with contributions from Asia, Europe and North America. Dr Abby Day is based at the University of Sussex, UK. The British Sociological Association Sociology of Religion Study Group began in 1975 and provides the primary forum in Britain for scholarship in the sociology of religion. The nature of religion remains of key academic interest and this series draws on the latest worldwide scholarship in compelling and coherent collections on critical themes. Secularisation and the future of religion; gender; the negotiation and presentation of religious identities, beliefs and values; and the interplay between group and individual in religious settings are some of the areas addressed. Ultimately, these books reflect not just on religious life but on how wider society is affected by the enduring religious framing of human relationships, morality and the nature of society itself. This series is part of the broader Theology and Religion in Interdisciplinary Perspective Series edited by Douglas Davies and Richard Fenn.